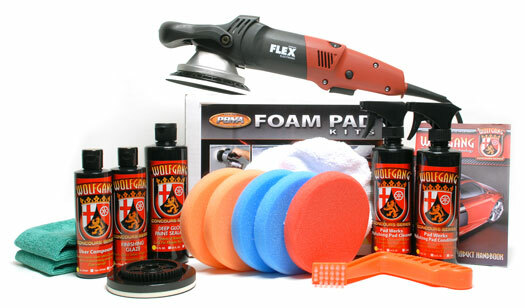 German engineering meets American know how for the ultimate polishing kit! Remove swirl marks, scratches, oxidation, etching and more. 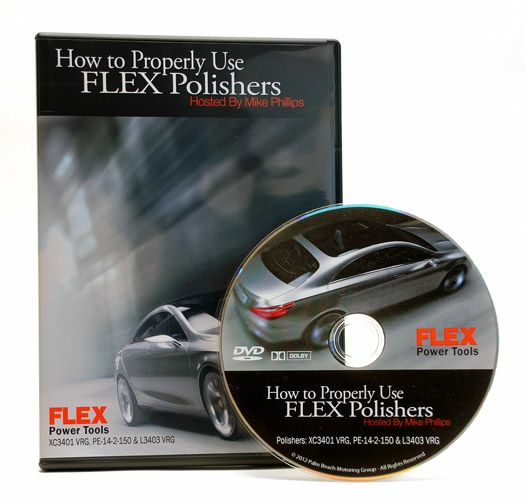 By combining FLEX Polisher's advanced engineering with Wolfgang Concour's German-American technology, the Wolfgang FLEX XC3401 Ultimate Polishing Kit gives you the ability to quickly, and safely, create a show car finish your garage. The FLEX XC3401 VRG is a highly-engineered dual-action polisher that uses a precise gear drive to power both the rotational and orbital action of the machine. What this means for you is faster results while still retaining the safety of an orbital polisher. The Wolfgang FLEX XC3401 Ultimate Polishing Kit is suitable for removing all forms of paint defects, from sanding scratches and oxidation to swirl-marks and acid rain etching. The carefully selected combination of Hydro-Tech Pads, Wolfgang Polishes, and the FLEX 3401 Polisher gives you professional results, immediately. If your vehicle suffers from unsightly paint defects or you wish to create a jewel-like shine, the Wolfgang FLEX XC3401 Ultimate Polishing Kit is for you. The FLEX XC 3401 Dual Action Polisher combines an orbital motion with forced-rotation for the perfect shine! The FLEX XC 3401 Orbital Polisher is a true forced-rotation dual action polisher! What that means is this polisher not only orbits but it also rotates too, at the same time. This dual action gives the Flex XC3401 superior paint correction ability. The FLEX XC3401 quickly removes swirls, scratches, oxidation and other paint defects that can�t be removed by other dual action polishers. The FLEX XC 3401 VRG Mini Backing Plate is made of durable molded plastic with a urethane pad to dampen vibration and heat. Hook and loop fasteners cover the bottom of the plate from edge to edge. The backing plate is 4 3/8 inches in diameter which allows the perfect mounting of 5.5 inch pads. Wolfgang Uber Compound 3.0, 8 oz. Wolfgang �ber Compound is a high-performance compound that is more than capable of removing severe paint defects while finishing like a polish. Engineered with a proprietary blend of micro and diminishing abrasives, Wolfgang �ber Compound quickly smooths away paint defects including P1200 sanding marks without dulling the finish or softening the shine. �ber Compound continues the excellence that has been defined by Wolfgang Concours Series Car Care Products by combining American and German technology. Wolfgang Finishing Glaze 3.0, 8 oz. Wolfgang Finishing Glaze 3.0 combines the shine enhancement of a glaze with the light paint correction of a polish into one ultimate finishing product. Compounding swirls, mild oxidation, and water spots disappear to reveal glassy smooth, beautiful paint. Underneath a wax or sealant, the paint radiates with energy and gloss. For the maximum gloss, don�t apply wax until you�ve applied Wolfgang Finishing Glaze 3.0. Wolfgang Deep Gloss Paint Sealant 3.0, 16 oz. After polishing your paint to perfection with Wolfgang's polishes, use Wolfgang Deep Gloss Paint Sealant 3.0 to seal in the shine and protect the paint. Wolfgang Deep Gloss Paint Sealant 3.0 will alter your perceptions of paint sealants forever. The glossy, liquid-like shimmer enhances all types and colors of paint. No other synthetic wax or paint sealant gives your vehicle the gloss, the depth, and the protection of Wolfgang Deep Gloss Paint Sealant 3.0. Now with fortified polymer technology, Wolfgang Deep Gloss Paint Sealant 3.0 is simply the best paint sealant you�ll ever use. Use this pale blue colored cyan foam with Wolfgang �ber Compound for compounding, scratch and swirl removal. The aggressive polishing action and gentle finishing action is a perfect compliment to the compound to restore paint without dulling or hazing it. Use this light-orange colored tangerine foam with Wolfgang �ber Compound for moderate polishing and defect removal OR with Wolfgang Finishing Glaze to impart a high-gloss, swirl-free finish. This pad can do it all. Use this red colored crimson pad to for final polishing with Wolfgang Finishing Glaze on soft paints or to lay down a perfectly even coat of Wolfgang Deep Gloss Paint Sealant. The crimson foam have is the perfect compliment to a perfect finish. Microfiber Bonnets turn your DA polisher into a wax removal machine. These bonnets are made from premium microfiber that is soft and gentle to the paint. The soft microfiber material is made up of tiny looped fibers, each 100s of times smaller than a human hair. This gives these Microfiber Bonnet the ability to remove car waxes and residues extremely easy. Wolfgang Pad Werks Polishing Pad Cleaner, 16 oz. Wolfgang Concours Series provides exceptional car care by combining precise engineering with the latest advancements in car care science. Wolfgang Pad Werks Polishing Pad Cleaner will safely and gently clean all styles of polishing pads: wool, microfiber, and foam. Perfectly clean pads perform more effectively, which is why Wolfgang Pad Werks is engineered to provide exceptional cleaning performance. Wolfgang Pad Werks Polishing Pad Conditioner, 16 oz. Total retail value of $646.84. You save $136.85! I am a huge fan of Uber compound, finishing glaze, and deep gloss sealant combo, and I became a fan after this kit. When I purchased this kit it was a bit more than the current sales price, but worth every dime. The FLEX 3401 has all the power you want in a DA style. I've used rotaries and pneumatic DA, but I prefer this over those due to it being a combination of both but with a slight advantage with forced drive orbital. The pads and products in this kit compliments the polisher perfectly and I have obtain very desirable results with this kit. Consthe microfiber towels can be a tad nicer (softer) to use for wiping off polish and stuff, but then again, you cant have it all for the price. I just had a chance to use this product for the 1st time and it is amazing! I used a Wolfgang polisher and a light cutting pad to buff out water and hazy spots on my carbon fiber diffuser and the result was as good as when it was new. A must have orbital buffer for any (self-proclaimed) car detailer!!!! ConsI wish it came with a 2-3 inch backing plate for small, angular areas (front lip spoiler, near the headlights, etc.). I really do not want to buy a whole new tool to take care of those small, but important paint surfaces.